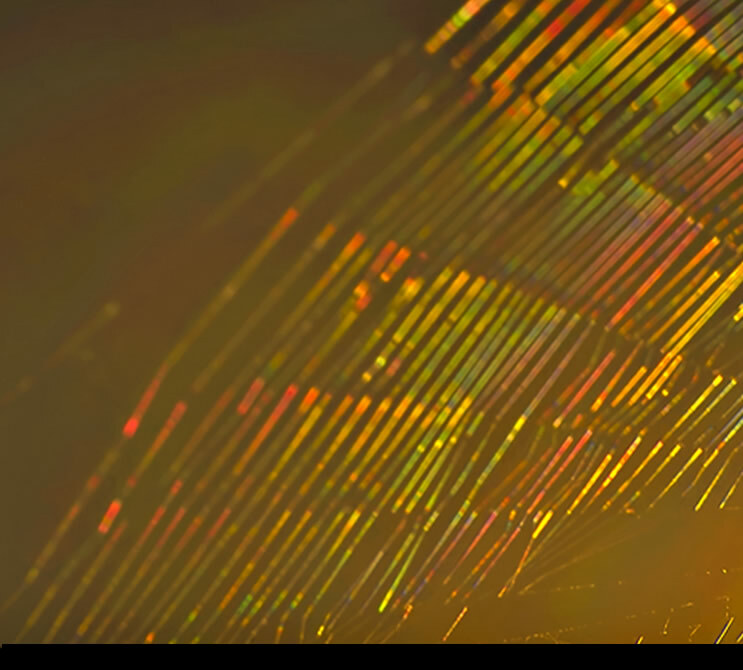 Colour bands on spider silk imaged by Ágnes Ori of Hungary. As well as contributing to a beautiful abstract, the deliberately out of focus threads show up best the enigmatic colour bands. View ‘dry’ spider webs, particularly towards the light and they can show iridescent colours. The colours often change rapidly along individual threads, an effect best seen in out-of-focus images. Water drops on bedewed webs show rainbow refraction glints but the colours on 'dry' webs arise instead from diffraction. Spider silk is 1-5 micron diameter and comparable to the wavelengths of visible light, 0.4 – 0.7 micron. 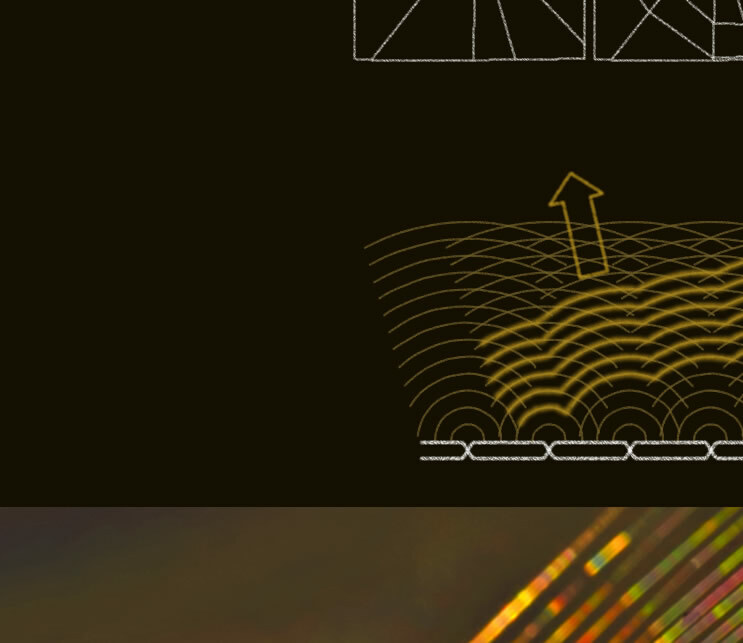 Incident light waves are scattered and combine to give colour dependent interference. There is a difference from atmospheric interference effects like a corona or glory. Those are from scattering by individual droplets or particles. In contrast, spider silk colours shriek of generation by quasi-periodic arrays of scattering centres. A regular array would be a one-dimensional diffraction grating pictured at lower right. The grating produces colours because individual outgoing waves from its scattering elements constructively interfere only in specific directions. What are the quasi-periodic structures? An orb web has several thread types. 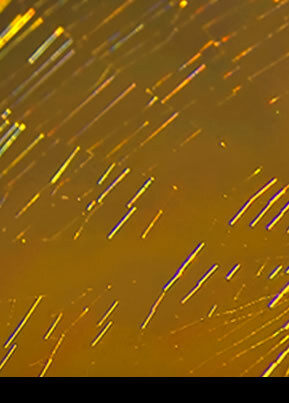 The ones pictured here showing iridescence are radial (non-sticky) threads and sticky capture threads. Spiral capture threads are engineering marvels. The silk is very strong. To withstand the impact of large flies it must also be very elastic. And it must be sticky. A combination of optical, electron and atomic force microscopy show that the silk has a smooth surface and is coated with a viscous glue which mostly accumulates (by surface tension forces) into globules. Large globules usually have a smaller one between them. The silk gathers inside the globules and thus keeps the thread taut. When a fly strikes the silk unreels and prevents the thread from snapping - just as a fisherman lets the line run. Some at least of the out-of-focus colours on capture threads arise from scattering by the quasi-periodic arrays of sticky globules. Radial threads colours are more problematic for there are no sticky globules. Their surfaces are, however, much rougher than those of capture threads. Some studies show internal structures where concentric protein fibrils are pleated. When the thread is stretched the pleats unfold rather like an accordian and confer elasticity. Again, we have quasi-periodic structures and it is possible that they, combined with the rough exterior are colour producing scatterers. 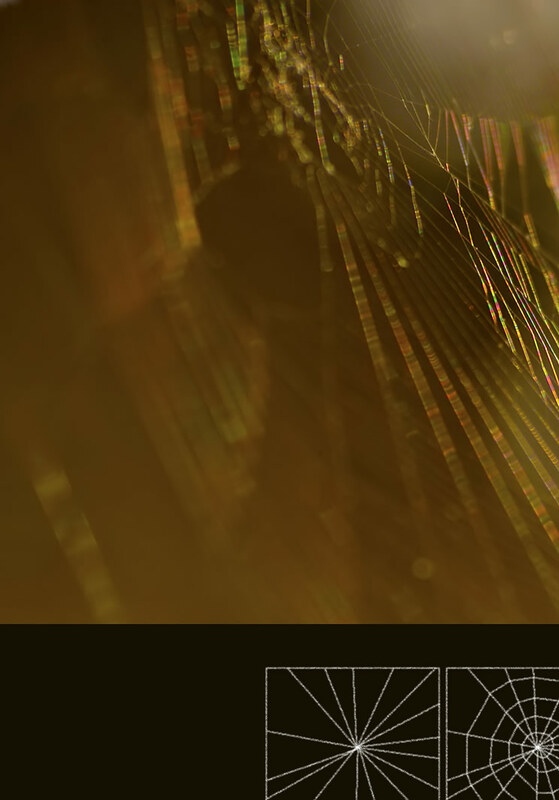 See also Dietrich Zawischa's account of spider silk diffraction. Spider silk has rather more to it than this sketchy account. It is an active research area because spider silk has many highly desirable properties superior to man-made fibres. A regular diffraction grating: Waves scattered by spaced objects constructively interfere and send coloured light in particular directions. Right: Capture thread with quasi-regularly spaced glue globules. Globules hold extra silk that unwinds when a fly hits the web.